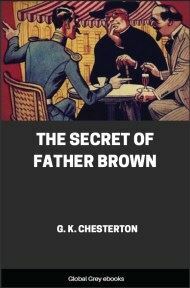 A collection of 9 short stories from the Father Brown collection: The Scandal Of Father Brown; The Quick One; The Blast Of The Book; The Green Man; The Pursuit Of Mr Blue; The Crime Of The Communist; The Point Of A Pin; The Insoluble Problem; and, The Vampire Of The Village. It would not be fair to record the adventures of Father Brown, without admitting that he was once involved in a grave scandal. There still are persons, perhaps even of his own community, who would say that there was a sort of blot upon his name. It happened in a picturesque Mexican road-house of rather loose repute, as appeared later; and to some it seemed that for once the priest had allowed a romantic streak in him, and his sympathy for human weakness, to lead him into loose and unorthodox action. The story in itself was a simple one; and perhaps the whole surprise of it consisted in its simplicity. Burning Troy began with Helen; this disgraceful story began with the beauty of Hypatia Potter. Americans have a great power, which Europeans do not always appreciate, of creating institutions from below; that is by popular initiative. 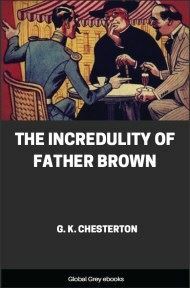 Like every other good thing, it has its lighter aspects; one of which, as has been remarked by Mr Wells and others, is that a person may become a public institution without becoming an official institution. A girl of great beauty or brilliancy will be a sort of uncrowned queen, even if she is not a Film Star or the original of a Gibson Girl. Among those who had the fortune, or misfortune, to exist beautifully in public in this manner, was a certain Hypatia Hard, who had passed through the preliminary stage of receiving florid compliments in society paragraphs of the local press, to the position of one who is actually interviewed by real pressmen. On War and Peace and Patriotism and Prohibition and Evolution and the Bible she had made her pronouncements with a charming smile; and if none of them seemed very near to the real grounds of her own reputation, it was almost equally hard to say what the grounds of her reputation really were. Beauty, and being the daughter of a rich man, are things not rare in her country; but to these she added whatever it is that attracts the wandering eye of journalism. Next to none of her admirers had even seen her, or even hoped to do so; and none of them could possibly derive any sordid benefit from her father’s wealth. It was simply a sort of popular romance, the modern substitute for mythology; and it laid the first foundations of the more turgid and tempestuous sort of romance in which she was to figure later on; and in which many held that the reputation of Father Brown, as well as of others, had been blown to rags. 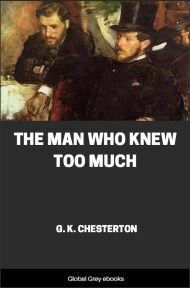 For Mr Rock was very firmly and rightly convinced that a very large number of things hadn’t ought to be. He was a slashing and savage critic of national degeneration, on the Minneapolis Meteor, and a bold and honest man. He had perhaps come to specialize too much in the spirit of indignation, but it had had a healthy enough origin in his reaction against sloppy attempts to confuse right and wrong in modern journalism and gossip. He expressed it first in the form of a protest against an unholy halo of romance being thrown round the gunman and the gangster. Perhaps he was rather too much inclined to assume, in robust impatience, that all gangsters were Dagos and that all Dagos were gangsters. But his prejudices, even when they were a little provincial, were rather refreshing after a certain sort of maudlin and unmanly hero-worship, which was ready to regard a professional murderer as a leader of fashion, so long as the pressmen reported that his smile was irresistible or his tuxedo was all right. Anyhow, the prejudices did not boil the less in the bosom of Mr Rock, because he was actually in the land of the Dagos when this story opens; striding furiously up a hill beyond the Mexican border, to the white hotel, fringed with ornamental palms, in which it was supposed that the Potters were staying and that the mysterious Hypatia now held her court. Agar Rock was a good specimen of a Puritan, even to look at; he might even have been a virile Puritan of the seventeenth century, rather than the softer and more sophisticated Puritan of the twentieth. 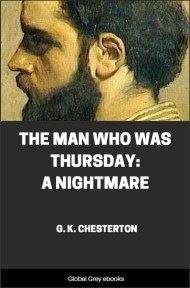 If you had told him that his antiquated black hat and habitual black frown, and fine flinty features, cast a gloom over the sunny land of palms and vines, he would have been very much gratified. He looked to right and left with eyes bright with universal suspicions. And, as he did so, he saw two figures on the ridge above him, outlined against the clear sub-tropical sunset; figures in a momentary posture which might have made even a less suspicious man suspect something.